In today’s universe, people are suffering from a distortion of terms, all in the name of political correctness. People say they support human rights; the right to life, the right to self-defense, the right of free-speech… but, suddenly, lines can seem to get a little blurred. Do people have the right of free-speech in a theater? In a mall? Or on anyone’s private property? Lets look at this from the viewpoint of the “right to property.” Who owns the local theater? The shopping mall? The people who own that mall or theater. Thus, the people making the decisions are the people who own the property. Its not about “your right to this or that”, its about respecting other people’s property rights, and them respecting yours. You DO have the right to free speech with your property! If you have your own newspaper, you can publish your thoughts freely. No one can hinder you. Just, the local newspaper editor doesn’t have to let every single note to the editor into the paper. He, with his property, has a right to choose what he places within his property. Another issue, using something that is relevant now, is the issue on the “right to health care.” Is there a right to health care? Yes. But, should other people have to give you health care? No. 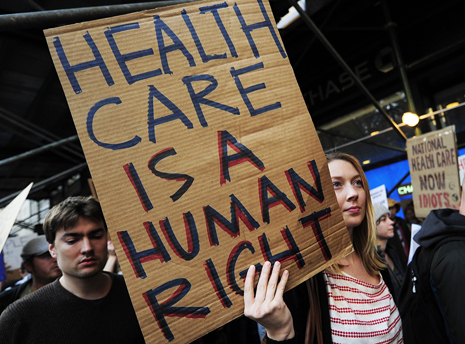 The right to health care is a negative right, like nearly all rights; its a right nobody has to take action on. Let me take a moment to explain a negative right. For instance, I have the right to a Jeep. I have just as much a “right” to a Jeep as I do to a Ford, a Honda, or a Toyota. But, do I have the right to force somebody else to get me that Jeep? No! I have the right to own a Jeep as much as I like, but nobody has to give me that Jeep. To force somebody to do that would be violating that other person’s property rights. Besides, if I get to enforce my “right to a Jeep” on somebody else, then, that means since they don’t manufacture Jeeps, they have to give me money towards a Jeep, which ultimately means that they can’t get what they were going to get with that money. I basically violated their right to a vacation, or something else they wanted to get or do. They are that much poorer now, and, I’ve taken away my incentive to have increased my income to have been able to afford a Jeep. So, I do have the right to have or own health care. Just, nobody has to go out of their way, and have their right to be left alone (right to property) violated by you. And, nobody can violate your property rights either. So, a lot of confusion can be avoided if we simply step back and, instead of looking at individual Human Rights, we just look at the whole thing… Property Rights. Reblogged this on Cool Stuph. Interesting topic, You said, ” should other people have to give you health care? No.” I understand your point as it relates to property rights, but should we as Christians feel compelled to provide health care even if not through the government? I totally agree with you! The Church actually used to carry out this function before the State took over. The apostles in Acts Chapter 6 set up the role of deacon, to care for the widows and the oppressed.